SYNOPSIS: When a tornado rips through town, twelve-year-old Ivy Aberdeen’s house is destroyed and her family of five is displaced. Ivy feels invisible and ignored in the aftermath of the storm–and what’s worse, her notebook filled with secret drawings of girls holding hands has gone missing. I don’t read a lot of middle grade novels, and when I do, they’re generally exclusively fantasy or historical fiction. When I think of MG contemporary novels, it’s not typically a book I’m going to reach for. That said, I have adored Ashley Herring Blake’s YA novels so tremendously (as you can see from my raving reviews of How to Make a Wish and Girl Made of Stars), that I knew I would love this little MG story, too, and was elated when she sent me an ARC. How was Ivy supposed to know how to handle all these feelings for June, all these feelings at all, if everything she saw and read about and heard about was all boy-girl, girl-boy? Ivy is such a precious, believable little character. She is so kind and loving, but struggles with a myriad of emotions that anyone who’s ever lived through the preteen years can relate to. She is jealous of her new baby siblings, misses her mother’s undivided attention, sees her father as her hero, and wants nothing more than to go back to calling her big sister Layla her best friend. There’s just one thing about Ivy that makes her feel a little bit different from the other kids her age. Her drawings didn’t embarrass her; they confused her. They scared her. Because she never wanted to draw a boy in those treehouses and she didn’t really understand why. Ivy is only interested in other girls, and at the time that we meet her, she’s still questioning a little bit, but mostly just scared to admit her orientation to herself, much less the people who love her. When she develops a crush on a classmate, June, she realizes quickly that there’s a name for the confusion she’s been feeling, but her entire life is already in upheaval and she doesn’t quite know how to cope. Normally, Layla was a good sister. Normally, she was Ivy’s friend. But normally had been sucked away by stormy drawings and tears and tornadoes. One of the scariest aspects of coming out, for June, is her big sister’s opinion on the matter. 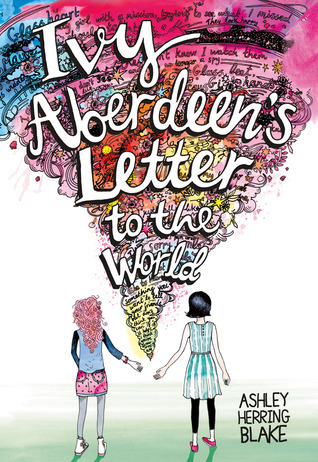 A recent fight between Layla and her best friend – also a queer girl – has left Ivy feeling unsafe among her own family. Ashley Herring Blake weaves this beautiful portrayal of how painful it is to feel unaccepted by one’s own loved ones, and how terrifying it can be to know that a part of your identity, something you could never change even if you wanted to, could make them see you differently or love you less. I’ve been there and felt those fears, as I know most queer individuals have, and it positively made my heart ache for Ivy every time the topic was breached. Boys ask girls to dances. Girls ask boys to dances. Ivy tried to remember a time when that didn’t happen at their school – when it was a boy and a boy or a girl and a girl – but she couldn’t. Ivy also suffers a lot of frustrations due to the utter lack of normalization and acceptance of queer individuals in her rural Georgia town, and from one Georgia gal to another, I related so hard to everything that pained her in this aspect. I grew up knowing so few outed queer individuals that I could’ve counted them on one hand until reaching my late teens, and I saw so little representation of LGBTQ+ relationships that I didn’t even understand my own desires for a very long time. Had I been shown how healthy and normal it was for a relationship to be comprised of anything other than one cis man and one cis woman, I can’t imagine how much it would’ve improved my self-worth and views on the world as a kid. Despite how abnormal queerness may feel to Ivy in the town she lives in, though, there is a bright light in the dark: a young black lesbian named Robin, who takes Ivy under her wing as soon as she notices that there’s something Ivy hasn’t quite come to terms with. Robin was my favorite character by far, because she was so maternal and kind, and reminded me so much of not only a figure I wished desperately I’d had as a teen, but also the kind of woman I desperately want to be for the children in my life, present or future. Robin never made Ivy feel silly, out of place, or as though she were overreacting in her fears and confusions. She also never pushed Ivy into labeling herself, and encouraged her to take some time to figure things out, explaining that there was nothing wrong with questioning your sexuality or abstaining from labels. I honestly lived for this character and everything she represented, as well as the fact that her own back story showed Ivy it was possible for a queer woman in the rural south to grow up, be happy, have a wonderful relationship, and embrace her sexuality. Ashley Herring Blake understands that it’s so incredibly crucial that queer books showcase the fact that LGBTQ+ individuals can have happy endings, too. It was like they’d forgotten they weren’t alone in this. At least, they’d forgotten they weren’t supposed to be. Finally, more than any other topic touched on in this beautiful little tale, I adored the fact that we see Ivy learn that the people who genuinely love you, and matter, will accept and support and love you, no matter what your orientation or identity falls under. She has such an incredible support system, and though they are imperfect, they do everything they can to fix their mistakes and to make her feel safe and warm. Funny, Ivy thought, all the things people could survive that they never imagined they could. I am so delighted to have had the chance to read an early copy of this book, and desperately hope that it is placed in every library, every school, and on the shelves of every child who has ever questioned their sexuality, or feared how the world will react to their identity. Ivy shows kids that being queer doesn’t have to mean a life of misery and fear and hiding, and that even if your friends and loved ones don’t always understand right away, if they truly need to be in your life, they will stand by you and treat you with the respect and love you deserve. All quotes are taken from an unfinished ARC and may differ from the finished publication. Thank you to Ashley Herring Blake and Little Brown Books for Young Readers for the ARC in exchange for an honest review! I’m so glad to see that these topics are getting more and more discussed in books for young people as well. Back in my teenage days (and i’m not even that old) this would have been considered scandalous most likely. Wrongly, i must say.